Draft: 2011, San Diego Padres, 12th rd. Colin signed a one-year minor league contract with an invitation to Spring Training in January ... has gone 7-7 with a 4.69 ERA (70 ER/134.1 IP) in 26 major league contests, all but one as a starter ... Missed the entire 2017 season after undergoing Tommy John surgery on November 11, 2016 ... appeared in 18 minor league games in 2018 (made season debut May 22) ... last pitched in the majors in 2016 ... Spent nearly his entire career in the Padres system ... was traded to Miami July 29, 2016 and appeared in one game before being traded back to San Diego three days later, August 1 ... Attended University of Northern Iowa, St. Petersburg College (FL) and Indiana State University ... was selected by San Diego in the 12th round of the 2011 First-Year Player Draft ... Graduated from Cascade (Iowa) High School ... was first team All-State as a senior. Colin made his season debut May 22 with Double-A San Antonio ... appeared in 18 games between San Antonio and Triple-A El Paso, going a combined 3-5 with a 5.73 ERA (48 ER/75.1 IP) ... Posted a 1.80 ERA (4 ER/20.0 IP) in his final five outings beginning July 30 ... struck out a season-high 10 batters in 5.0-scoreless innings, July 30 at Oklahoma City. Missed the entire season recovering from Tommy John surgery on his right arm on 11/11/16. Set career highs in every category, including wins (five), games started (19), innings pitched (102.2) while pitching to a 4.82 ERA (55 ER, 102.2 IP)...Allowed three earned runs or less in seven of his eight starts from 4/13-5/22, posting a 3-2 record with a 3.72 ERA (19 ER, 46.0 IP) while limiting the opposition to a .231 (40-for-173) average...The Padres were 11-8 in his 19 starts this season...Traded to the Miami Marlins in a seven player trade on July 29 and reacquired on August 1 from the Marlins in exchange for RHP Luis Castillo...Missed the final 58 games of the season on the 15-day DL with right elbow soreness ...underwent Tommy John surgery on 11/11...Entered 2016 as the No. 4 prospect in the Padres organization by ESPN.com and MLB.com and No .7 by Baseball America. Made his Major League debut for San Diego with six starts after going a combined 5-4 with a 1.95 ERA (22 ER, 101.2 IP) and 80 strikeouts against 23 walks with a .210 opponent in average over 18 starts between Double-A San Antonio and Triple-A El Paso…His 1.95 ERA in the minors ranked as fifth-best of any minor leaguer with at least 100.0 innings pitched in 2015…Began the season with Double-A San Antonio and went 3-2 with a 1.08 ERA (9 ER, 75.0 IP) and 60 strikeouts against 11 walks with a .185 opponents average over 12 starts…named a Texas League Mid-Season All-Star for the Missions…his ERA at the time of his promotion to Triple-A on 7/3 was leading the Texas League…Promoted to El Paso on 7/3, making six starts for the Chihuahuas and going 2-2 with a 4.39 ERA (13 ER, 26.2 IP) before being selected by San Diego for his first career Major League call-up on 8/11…Selected to represent the Padres for the U.S. Team at the 2015 SiriusXM All-Star Futures Game at Great American Ball Park on 7/12, recording the final two outs of the game with one strikeout…Made his Major League debut for the Padres on 8/11, recording the win after working 5.0 innings and allowing three runs against the Reds…recorded his first career Major League hit in his first plate appearance with a single off of Michael Lorenzen…Made his final start of the season on 9/8 vs. COL, throwing 7.0 shutout innings, allowing just two hits. February 6, 2019 RHP Colin Rea assigned to Iowa Cubs. January 10, 2019 Chicago Cubs signed free agent RHP Colin Rea to a minor league contract and invited him to spring training. 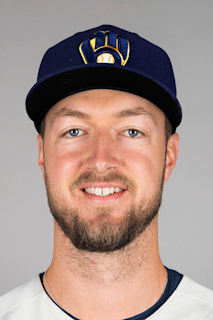 November 20, 2018 San Diego Padres designated RHP Colin Rea for assignment. October 2, 2018 San Diego Padres recalled RHP Colin Rea from El Paso Chihuahuas. August 19, 2018 El Paso Chihuahuas activated RHP Colin Rea from the 7-day disabled list. August 2, 2018 El Paso Chihuahuas placed RHP Colin Rea on the 7-day disabled list retroactive to July 31, 2018. June 21, 2018 San Diego Padres optioned RHP Colin Rea to El Paso Chihuahuas. June 21, 2018 San Diego Padres reassigned RHP Colin Rea to the minor leagues. May 22, 2018 San Diego Padres sent RHP Colin Rea on a rehab assignment to San Antonio Missions. March 30, 2018 San Diego Padres transferred RHP Colin Rea from the 10-day disabled list to the 60-day disabled list. Right shoulder strain. March 28, 2018 San Diego Padres placed RHP Colin Rea on the 10-day disabled list retroactive to March 26, 2018. Right shoulder strain. November 6, 2017 San Diego Padres activated RHP Colin Rea from the 60-day disabled list. February 19, 2017 San Diego Padres placed RHP Colin Rea on the 60-day disabled list. October 3, 2016 San Diego Padres activated RHP Colin Rea from the 15-day disabled list. August 1, 2016 San Diego Padres placed RHP Colin Rea on the 15-day disabled list. Right elbow sprain. July 31, 2016 RHP Colin Rea roster status changed by Miami Marlins. July 30, 2016 Miami Marlins activated RHP Colin Rea. June 2, 2016 San Diego Padres recalled RHP Colin Rea from El Paso Chihuahuas. May 23, 2016 San Diego Padres optioned RHP Colin Rea to El Paso Chihuahuas. August 11, 2015 San Diego Padres selected the contract of Colin Rea from El Paso Chihuahuas. July 1, 2015 RHP Colin Rea assigned to El Paso Chihuahuas from San Antonio Missions. June 13, 2015 San Antonio Missions activated RHP Colin Rea from the 7-day disabled list. April 7, 2015 RHP Colin Rea assigned to San Antonio Missions from Lake Elsinore Storm. March 10, 2015 RHP Colin Rea assigned to San Diego Padres. June 26, 2013 RHP Colin Rea assigned to Fort Wayne TinCaps from Lake Elsinore Storm. April 2, 2013 Colin Rea assigned to Lake Elsinore Storm from Fort Wayne TinCaps. September 8, 2012 Colin Rea assigned to Fort Wayne TinCaps from Eugene Emeralds. September 5, 2012 Colin Rea assigned to Eugene Emeralds from Fort Wayne TinCaps. March 31, 2012 Colin Rea assigned to Fort Wayne TinCaps from Eugene Emeralds. June 16, 2011 Colin Rea assigned to Eugene Emeralds from San Diego Padres. June 11, 2011 San Diego Padres signed RHP Colin Rea.